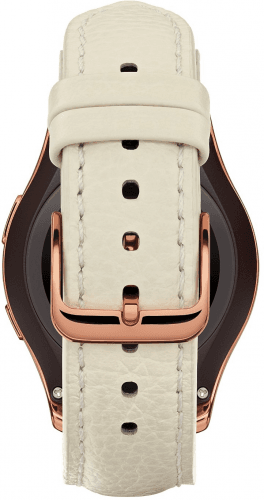 Also known as Width: (44.0 for the 3G model) Height: (51.8 for the 3G version) Depth: (13.4 on the 3G version) Samsung GEAR S2 Classic Samsung S2 Classic, the Gear S2 Classic drops the elastomer wristband of the regular Gear S2 and goes for a leather watch band, which is also user-replaceable with any compatible wristbands, while it stands out from the regular Gear S2 model with its noticeably notched-rotary-bezel design, with a glossy-finish body compared to the matte brushed-metal body of the regular model. Also, it deflects scratches from regular daily use with a Corning Gorilla Glass 3-encased display. 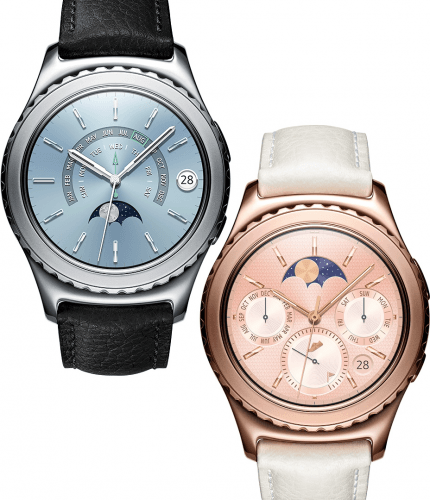 Also known as Width: (44.0 for the 3G model) Height: (51.8 for the 3G version) Depth: (13.4 on the 3G version) Samsung GEAR S2 Classic Samsung S2 Classic, Samsung GEAR Classic, Samsung S2 GEAR Classic, Samsung Classic, Samsung SM-R7320ZKAXAR, Samsung GEAR S Classic, Samsung GEAR S-2 Classic, Samsung SM-R732, Samsung SM-R7320ZDAXAR, Samsung SM-R7320WDAXAR. 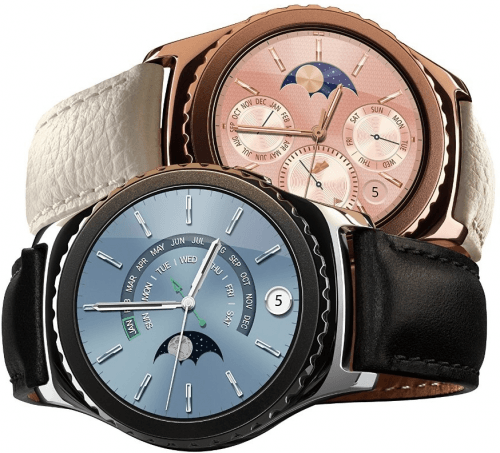 Latest Samsung smart watches See all the new Samsung smart watches.